Diet isn’t the only possible cause of an acidic pH reading. Your cellular physiology also responds to your state of mind. Chronic disappointment or sadness impregnates your cells with a kind of “grief disease”. Physical symptoms may include constipation. This is the body’s way of “holding on” to its past. Chronic sinus infections are another example of the body not letting go. In this case, the accumulation of un-cried tears block the sinuses. Antibiotics will do nothing to release this emotion. The emotion of Nat-m instinctively seeks to protect itself. “I got hurt in the past, and will never let that happen again.” This personality doesn’t allow anyone to get too close, in the emotional sense. Any emotional bonding or intimacy raises subconscious fears of getting hurt again. A more superficial pattern of social interactions is typical. They “hold their cards close to their chest,” as the expression goes. We’re portraying the more extreme version of this emotional state. The average case of Nat-m is not this overt. They may have close, intimate relationships, in contradiction to the above definition. Yet, a Nat-m state may still exist at the level of cellular functioning. This creates a state of cellular acidosis. As you know, this goes against the functions of natural fertility. A miscarriage could be the trigger of a Nat-m state. Or even your general perception of “failure” at not being able to conceive. The telltale signs of monthly blood in your underwear can reinforce this. You only crave to see the plus sign in the glass frame of a pregnancy test. Disappointment and “holding on” may be your natural emotional response. You may even feel that it is your fault, somehow. You may project that grief onto your own physiology, your parents, or your partner. This means you’ll have a hard time receiving water, nutrition, or even a new life. You may find yourself irritable at this point. To some degree, your worldview becomes colored by this Nat-m state. There’s an interesting phenomena we’ve observed around this. It illustrates how the idea of “letting go” connects to fertility. You may have heard stories of an ‘infertile’ couple suddenly receiving a surprise pregnancy? This typically happens right after they’ve adopted a baby. That’s because they have finally “let go” of their attachment. They are no longer attached to conceiving a baby, and open themselves up to new possibilities. This pure act of “letting go” unblocks their fertility function. New hope replaces grief and disappointment. We’ve seen this identical phenomenon in couples who needed Nat-m in their fertility plan. With the correct, individualized dose and potency, the effect can be dramatic. In all homeopathic healing, the state of mind shifts first. Then the physical symptoms follow suit. Signs of improvement start along with this prescription. Subtle signs of improved sleep, mood, or an overall sense of wellbeing come first. Fertility and conception are usually not far behind. The mind leads, and the body follows. The mind “lets go”, and the cellular functions return to normal. Proper pH balance returns, and the vaginal mucous creates a fertility friendly environment. The effort you’ve put into a healthy diet finally starts to bear fruit. Note that ‘positive thinking’ is not enough to reverse such a state. Especially when it has penetrated the cellular functioning. Visualization or meditation cannot “cure” a deeper Nat-m state of mind. Do you feel that you’ve “run out of rope” with diet and lifestyle changes? This idea can breathe new life into your fertility plan. The “state of mind” of your cells is as powerful as a healthy fertility diet. 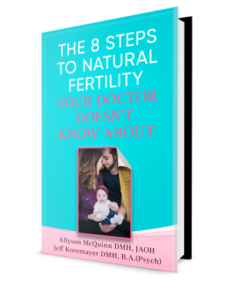 This topic is further explored in The 8 Steps to Natural Fertility Your Doctor Doesn’t Know About.